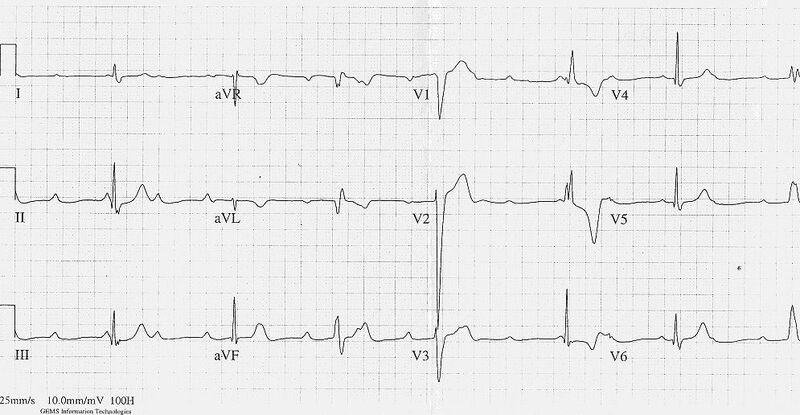 What's your assessment and care of a 50-year-old male complaining of chest pain? Basic Level: Evaluation of a patient complaining of chest pain suggestive of Acute Coronary Syndrome. Identifying an atrioventricular block. Intermediate Level: Evaluating a list of differential diagnoses for any patient with chest pain and an atrioventricular block even without evidence of ST elevation myocardial infarction (STEMI). Advanced Level: Determining appropriateness of external pacing for a symptomatic but stable patient with an atrioventricular block. You are working the evening shift on unit ALS1 with an EMT partner. At 1830 hours you are dispatched with red lights and sirens to the home of a 50-year-old male complaining of chest pain. You are greeted at the door by a young girl who says she is worried about her grandfather, who is sitting upright on a couch in the family room. As you walk up to the patient, you find a Caucasian male with his fist tightly clenched on top of his chest. He does not appear to be short of breath and you can see that his skin is pale and wet. You begin the assessment by kneeling down and feeling for a radial pulse while asking the patient for details of the OPQRST. He states that while watching the 6 p.m. television news, a sudden burning chest pain began in the retrosternal region and began radiating to both arms. He also states that he waited for several minutes before telling his wife, who became excited. He states that he did not want to call for EMS, but in order to calm down his wife, he agreed to let her call after she noticed that he was sweating profusely. The patient states that there have been no changes in the symptoms since they began almost 45 minutes prior. As the physical exam is continued, you find that he is alert and oriented to person, place and time without neurological deficit, the HEENT (Head/Eyes/Ears/Nose/Throat) exam is normal, non-reproducible retrosternal chest pain and the abdomen is soft and non-tender, with no pain or edema in his extremities. The patient denies any recent gastrointestinal bleeding or allergy to aspirin. Your partner begins administering oxygen by nasal cannula at 4 lpm (liters per minute) and administers 325 mg of aspirin while you establish an IV with 0.9% normal saline at a rate sufficient to keep the vein open. The EKG monitor is placed and a strip for rhythm analysis is obtained while simultaneously palpating the radial pulse again. You notice the ventricular rate is regular and matches the radial pulse. What else do you notice about this strip? 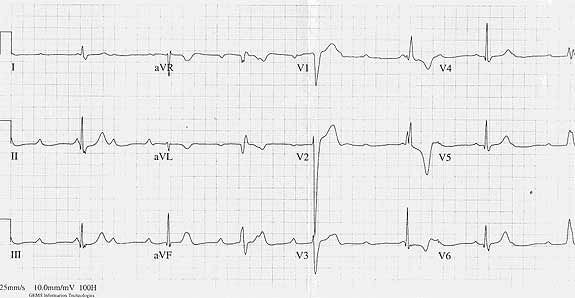 The most effective way to evaluate a rhythm strip or diagnostic EKG is to follow a repeatable pattern. Concerned about the patient, you administer a sublingual nitroglycerin tablet while your colleague goes outside to retrieve the stretcher and then you obtain a 12-lead (diagnostic quality) EKG. It is very important to follow a repeatable pattern while interpreting an EKG; this is particularly true of 12-lead EKGs. The same applies here. Most cardiac monitors also offer an automated interpretation; however, there are many instances when this automated interpretation can be wrong. This is one of the primary reasons why the EKG Club is bringing this case to you. We will provide the computed interpretation for you to reference whenever available, although reliance on its findings is discouraged. You administer a sublingual nitroglycerin tablet and contact medical command while setting up to leave the scene. Transport time is estimated at 20 minutes to the nearest tertiary center with cath lab capabilities. The patient does not report any pain relief with the nitroglycerin. After five minutes you administer a second SL nitroglycerin tablet with equal results. The transport time to the nearest tertiary center with cardiac catheter lab capabilities is estimated to be 20 minutes. A local hospital, in the rural town where the patient lives, is only a few minutes away. Where should this patient be transported? Who do you involve in deciding where to transport the patient? What is included in your list of differential diagnosis possibilities?